Use these resources to encourage your child's math learning at home! Looking for engaging ways to weave math into the day? You might find just what you’re looking for in your home or local library. Many children’s books are perfect for introducing and reinforcing math concepts. Math knowledge is useful for all of us—from children to adults—in all aspects of our lives. When parents and teachers get excited about math, then children get excited about math. You can expand your children’s learning environment by helping them identify, create, name, and take apart shapes during your regular routines. Las familias pueden ayudar a sus hijos a identificar, crear, nombrar y distinguir formas durante sus rutinas, actividades y conversaciones habituales en casa. Noticing when your child brings mathematical words and ideas into conversation or play can be a jumping-off point for helping him or her get a head start on understanding math. Las experiencias tempranas de agrupar y clasificar ayudan a los niños pequeños a observar en qué se parecen y en qué se diferencian las cosas. Esta comprensión les servirá cuando estén aprendiendo técnicas matemáticas en la escuela primaria. Aquí les proponemos algunas formas de realizar esas actividades en su casa. Tips for how to keep things fun as you encourage your child to explore math. Six fun and simple activities to support your child's math readiness. Even the youngest of children can respond to music and the mathematical principles behind it. Here are three musical elements that relate to math and activity ideas to try at home. The more parents talk with their child about math at home, the more a child’s mind is stimulated to think about math. Here are five ways to use math talk with your child. Children develop math concepts and skills very early in life. How we talk with infants and toddlers about math ideas like more, empty, and full—matters. Preschoolers aren’t yet ready to memorize multiplication tables, but that doesn’t mean they cannot learn and explore math concepts. Try these ideas at home to help your preschooler explore math. Fun math games to enhance young children's mathematics learning and persistence from the Education Development Center (EDC). Make a printable half fold mini-book! Each math activity has two pages: Print each page single sided. Place the blank side of the two pages together. Fold in half to complete your mini-book. For more content about early math visit the EDC website at https://www.ym.edc.org. Math activities to try at home with your child from The Bedtime Math Foundation. Use this guide to help your children have fun counting and thinking about numbers with their favorite stuffed animal toys at home! How Much Math Can You Find in One Flower? The Bedtime Math Foundation is a national nonprofit organization dedicated to helping kids love numbers so they can handle math in real life. For more information, visit www.bedtimemath.org. Teachers! Looking for more on math for your classroom? 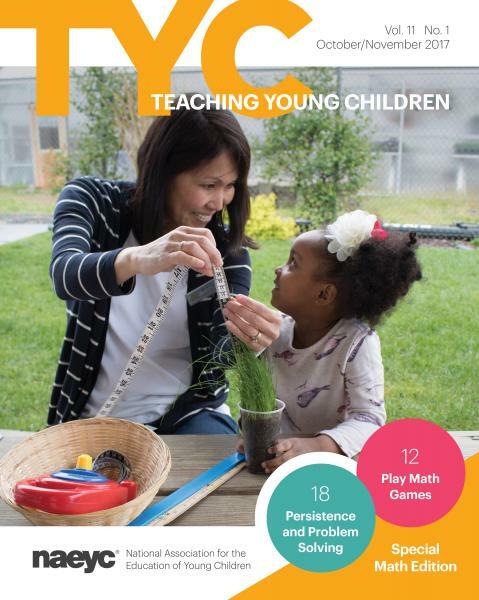 Learn all about math fluency in the October/November issue of Teaching Young Children! Articles include ideas for math games, making math meaningful for diverse learners, and more!